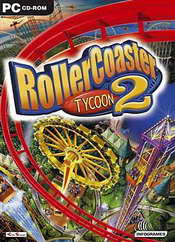 Ironically, Roller Coaster Tycoon 2 itself is an imitator of RCT. Perhaps in an effort not to spoil a good thing, or perhaps to guarantee success with low-system-spec mainstream fans,Roller Coaster Tycoon 2 plays almost exactly like the original game--maybe too much like it. The graphics are still 2-D, and if you didn't know better you'd swear you were looking at the first game. This isn't good considering that the first game came out in 2000 and looked dated even then. But the ability to play the game at a much higher resolution does alleviate some of this disappointment, and a closer look reveals a greater variety of animation, more people, and a smoother overall look. The audio is, again, fantastic. It's that perfect mix of screams, giggles, grumbles, retches, and carnival music that brings the scent of cotton candy to your nose every time. New structures are available as well as some new rides, but the biggest change is the addition of themes. Want a Haunted Park? They've given you the artwork to create one. You'll also find a Wild West theme, a children's theme, and more. The scenarios are grouped more logically by difficulty, and fans will be delighted with a sand box mode that allows limitless free play. RCT2 has a wide variety of new coaster designs, including a few famous coasters from around the world--mostly from Six Flags theme parks. A welcome addition is the ability to open a separate screen where you can test and build a custom coaster, without worrying about space or money, before buying and placing it in the game. Perhaps the best new addition is the ability to raise and lower ground en masse, removing one of the most annoying features of the first game. this message appear what can i do? oyun çalışıyor mu sorunsuz ? ?